Christmas, TB Seals, Easter Seals, Boys Town Seals, and other Charity Seals. Charity seals: Stamp-like adhesive labels that are distributed by a charity in exchange for a donation. They have no postal validity, although they are often affixed to envelopes. U. S. Easter Seals, Boys Town Seals, various Catholic Charities, and Jewish National Seals are examples of charity seals issued by U.S. based charities. Odder Charity Seals, and Aalborg Charity Seals, are examples of charity seals issued by Denmark based charities. Barns Dag Kumla, and Swedish Advent Charity Seals are examples of charity seals issued by Sweden based societies. Norwegian Seaman's Fund, Norwegian Blue Cross, Norwegian Help Fund Charity Seals, and Norwegian Advent Seals are issued by societies in Norway. Further, The charity seals issued by the Rotary Club of Kopavogs, Iceland, is an example of a seal from a charity based in Iceland. Cross of Lorraine: The red double-barred cross is known as the international symbol for the crusade against Tuberculosis and appears on most all known Christmas and anti-TB Charity Seals. If you are unsure as to the type of charity seals, look for this symbol. Since the early TB Charity Seals were issued by the Red Cross, the Red Cross symbol will appear on those seals, instead of the Cross of Lorraine. A red crescent is often used on TB Charity Seals issued in the Middle East. Christmas TB Charity Seals: TB Charity Seals which were issued near, at, or for Christmas and have Christmas themes. 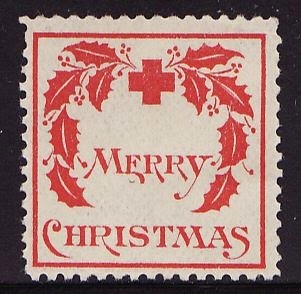 Since these TB Seals were issued near Christmas and have Christmas themes, they have also become known as Christmas Seals. We classify them as Christmas TB Charity Seals, or simply Christmas TB Seals. TB Charity Seals issued nationally in the United States and Canada are examples of Christmas TB Seals. Spring TB Charity Seals: TB Charity Seals which were issued near, at, or for Easter and have Spring, or nature themes. Since these TB Charity Seals were issued near Easter and have Spring, or nature themes, they have also become known as Spring TB Charity Seals. We call them Spring TB Seals, or simply Spring Charity Seals. We classify them as Charity Seals. Many Christmas Seal collectors prefer mounting their collection on blank pages, rather than use White Ace album pages. We have added a new item to our store which should please collectors who wish to use blank pages. Christmas Seal Album Pages, Blank. Christmas Seal Album Pages, blank, package of fifteen (15) sheets. All that is required is the addition of seals, and an album cover. Design your own placment of your seals. The headings and borders are in full color. Printed on heavy, acid-free 67# cardstock, with rounded corners. Printed on one side. Standard 81/2x11 inch 3 ring punched. Cream or White. Saint Crispen Publishing. The pages are acid-free, a feature which will enable collectors to affix their collection by either mounts or hinges to the pages, with minimum concern to deterioration. The 67# cardstock is heavier than normal paper with rounded corners which prevents corner curling. Just add a binder of your choice and you are ready to proudly display your collection to others. The 2011 U.S. Christmas Seals are now listed in our store. Currently, we are offering four sheet varieties. One national sheet and three test sheets. The 2011-1x, 2011 U.S. Christmas Seals, Sheet of 56, VF, MNH. Sheet of 56 (8x7) without gift tags, margin on 4 sides, "Fighting for Air." Dated 2011 with "R12-CSCS-4-01 in bottom margin. Seal size: 17x24mm. Silver margin scans much darker than actual color. This sheet is distributed nationally. 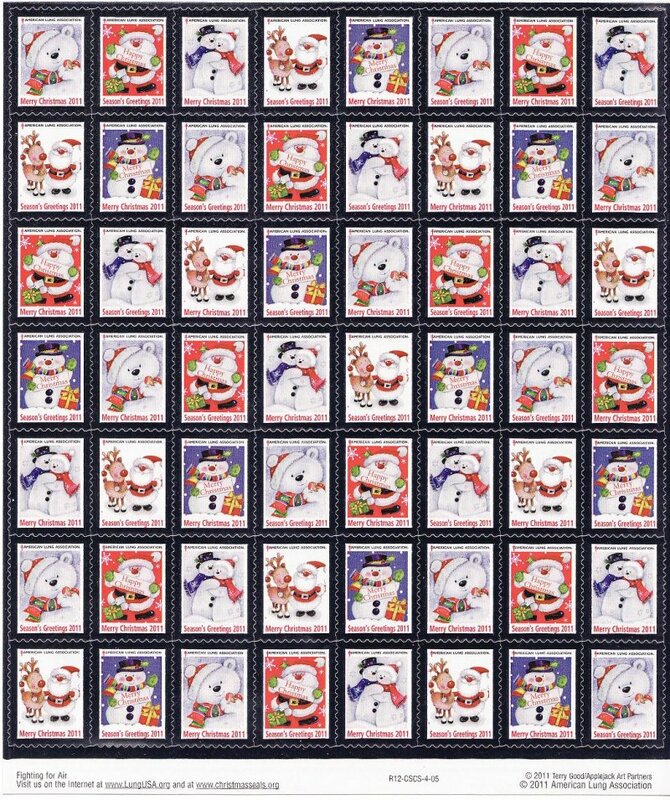 2011-1x, 2011 U.S. Christmas Seals, Sheet/56 Mint! The following sheets are test deigns available for 2011. Since 1979, the American Lung Association has issued test designs to determine the design of the national seal for the following year. 2011-T1x, 2011 U.S. Christmas Seals, Sheet of 56, VF, MNH. Issued 2011, Teddy Bear, Snowmen, Santa, Reindeer, with silver foil border. Sheet of 56 (8x7) without gift tags, margin on 4 sides, "Fighting for Air." Dated 2011 with "R12-CSCS-4-05 in bottom margin. Seal size: 17x24mm. Silver margin scans much darker than actual color. 2011-T1x, 2011 U.S. Christmas Seals, Sheet/64, Mint! The 2011-T2x, 2011 U.S. Christmas Seals, Sheet of 56, VF, MNH. 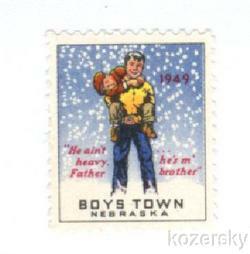 Issued 2011, boy on sled, Santa, snowmen, puppy, Christmas scene, with silver foil border. Sheet of 56 (8x7) without gift tags, margin on 4 sides, "Fighting for Air." Dated 2011 with "R12-CSCS-4-06 in bottom margin. Seal size: 17x24mm. Silver margin scans much darker than actual color. 2011-2x, U.S. Christmas Seals, Sheet/56 Mint! 2011-T3x, 2011 U.S. Christmas Seals, Sheet of 56, VF, MNH. Issued 2011, Christmas Tree, bells, candles, Christmas scenes, with silver foil border. Sheet of 56 (8x7) without gift tags, margin on 4 sides, "Fighting for Air." Dated 2011 with "R12-CSCS-4-07 in bottom margin. Seal size: 17x24mm. Silver margin scans much darker than actual color. 2011-T3x, 2011 U.S. Christmas Seals, Sheet/64, Mint! There are various ways to collect Christmas Seals. Many collectors just collect one seal from each year, while others collect the seals yearly, in the format, as required by the descriptions in the Scott, or Green's Catalogs. This post will discuss collecting Christmas Seals in full sheets, by the decade, one sheet for each year, without concern for printer's marks, perforations, or other factors. As your collection grows, you can easily branch out, and include sheets by printer's mark for each year, or concentrate on other characteristics of the seals. 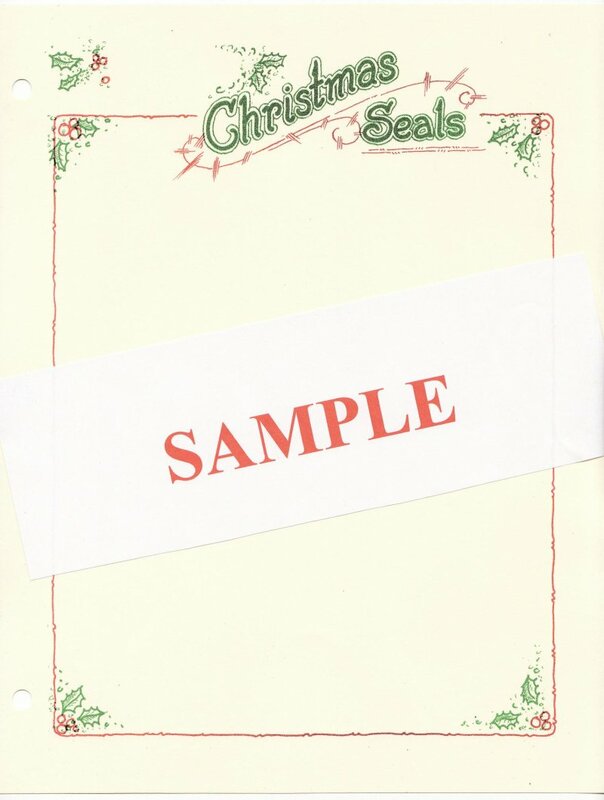 The Christmas Seal Sheet Collections are available in the Christmas Seal Category of our store. An example collection would be that of the Christmas Seals that were issued from 1940-49. The 1940-49 Christmas Seals, sheets are F-VF, full gum, MNH. There are ten (10) full sheets of 100, one (1) for each year: 1940, 1941, 1942, 1943, 1944, 1945, 1946, 1947, 1948, and 1949. This is an excellent and economical way to begin or enlarge a Christmas Seal sheet collection. Another eample would be the Christmas Seal Collection for 1950-59. The 1950-59 Christmas Seals, ten (10) F-VF, full gum, MNH, full sheets of 100. One (1) sheet for each year: 1950, 1951, 1952, 1953, 1954, 1955, 1956, 1957, 1958, and 1959. This is would also be an excellent and economical way to begin or enlarge a Christmas Seal collection. Further, another example is with a larger collection from 1932-81. 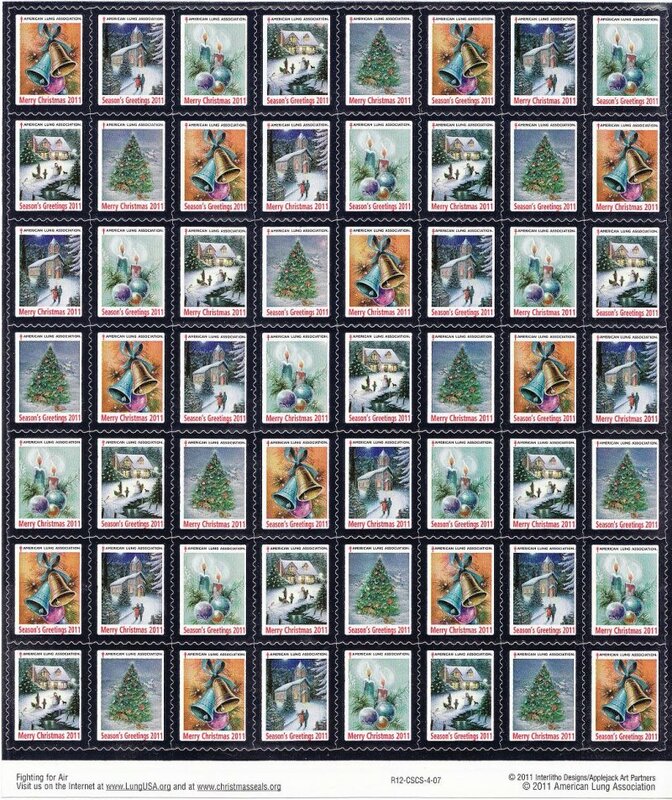 The 1932-81 Christmas Seals, contains fifty (50) F-VF, full gum, MNH, full sheets of 100. 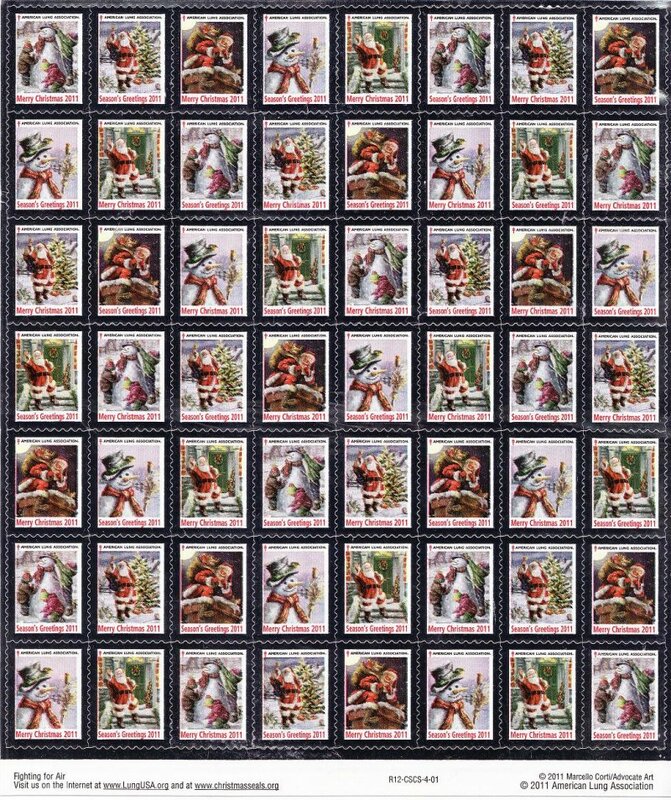 One sheet for each year: 1932 to 1981, fifty years of mint Christmas Seals. This is also an excellent and economical way to begin or enlarge a Christmas Seal sheet collection. 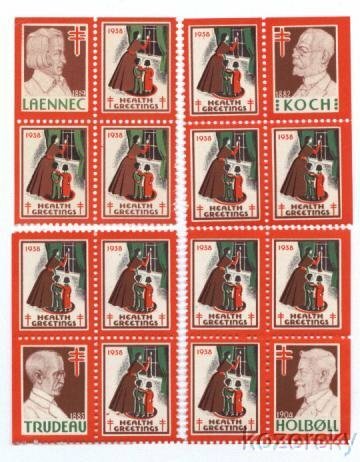 Christmas Seal Sheet Collections are also available for the following years: 1927-31, 1932-39, 1960-69, 1970-79, 1980-89, 1990-99, and 1982-2008. 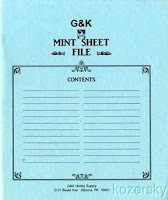 The sheets are usually saved in Sheet Files, or in sheet protectors, placed within a binder. Items in this category are now being shipped fully insured against loss, or damage. New items arrive daily. Check back often as we are continually adding to our stock. Further, be sure to check out our supplies, catalogs, or album pages. The 2009 U.S. Christmas Seals are now listed in our store. Currently, we are offering two sheet varieties. The 2009-1x1, U.S. 2009 Christmas Seals, Sheet of 64, VF, MNH. Issued 2009, sheet of 64 (8x8) without gift tags, margin on 4 sides, "Fighting for Air" in the bottom margin. Dated 2009 with "R10-CSCS-4-01 in bottom margin. Seal size: 17x24mm. 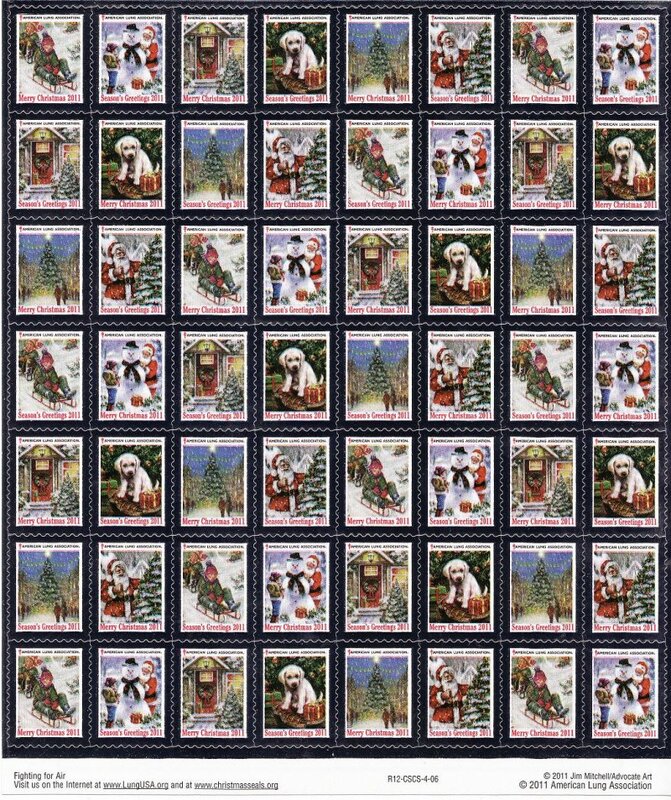 2009-1x1, U.S. Christmas Seals, Sheet/64 Mint! 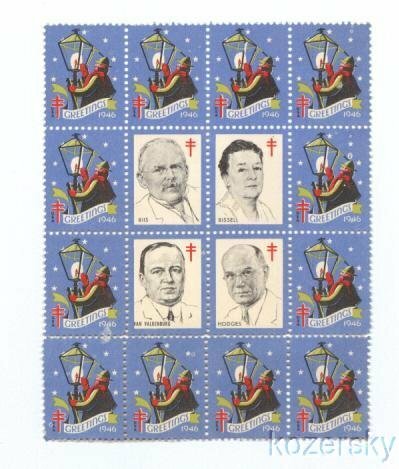 And, the 2009-1x3, U.S. Christmas Seals, Sheet of 64, VF, MNH. Issued 2009, sheet of 64 (2x8) + (3x8) + (3x8) without gift tags, margin on 4 sides, "Fighting for Air." Horizontal gutters between 2nd & 3rd, and 5th & 6th rows. Dated 2009 with "R10-FU1S-4-01 in top margin. Seal size: 17x24mm. 2009-1x3, U.S. Christmas Seals, Sheet/64, Mint! The 1938 Portrait Seals were located in the four corners of the sheets and were different than the other ninety-six seals. The four portrait seals contained the images and names of four men active in furthering the work to eliminate TB. Seal #1 shows an image of Dr. Rene Laennec of France, who in 1816 invented the stethoscope. Seal #10 shows an image of Dr. Robert Koch of Germany, who in 1882 proved TB to be a germ born disease. Seal #91 shows an image of Dr. Edward L. Trudeau of New York, who in 1885 established the first Umnited States TB sanatorium at Saranac Lake, New York. 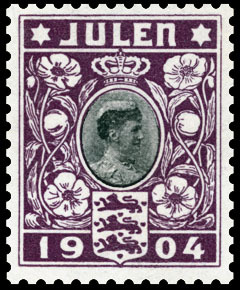 Seal # 100 shows an image of Einar Holbell, the Danish postal clerk who in 1904 started the sale of Christmas Seals in Denmark. The 1938 Portrait Christmas Seals are usually collected in blocks of four; one portrait seal with three regular seals. 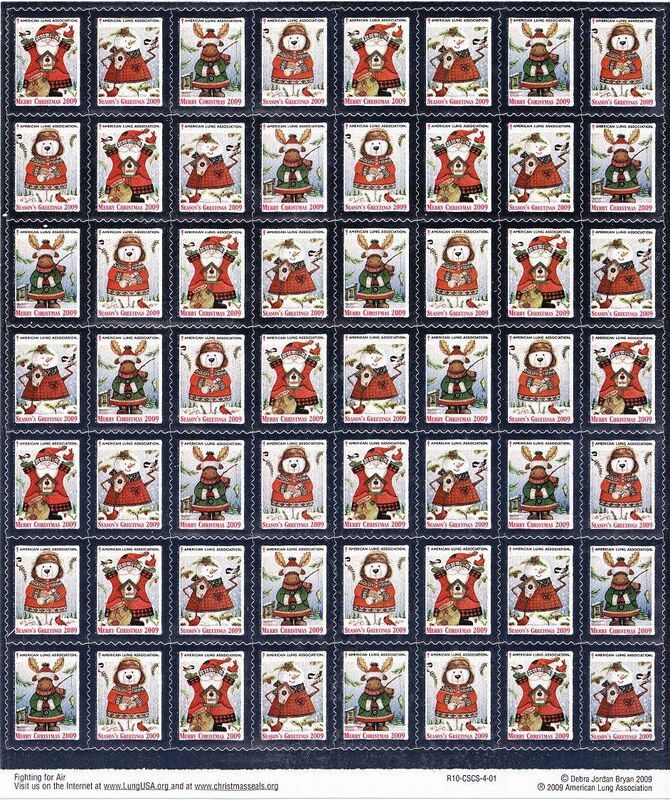 The 1946 Portrait Christmas Seals were located in the center of the sheet. There were four portrait seals, and ninety-six normal seals in a sheet. The four portarit seals contained images of the people considered responsible for the sale of the first Christmas Seal in 1907. Seal #45 - Jacob Riis, who first called attention to the 1904 Danish Christmas Seal and urged that the U.S. adopt the idea to raise funds to fight TB. Seal #46 - Miss Emily Bissel, who designed the seal. Seal #55 - E.A. Van Valkenburg, editor of the Philadelphia North American, the newspaper which publicized the seal. Seal #56 - Leigh Mitchell Hodges, the man whose interest was aroused by Miss Bissell, and who wrote the articles which aroused public support for the sale of the first seals. 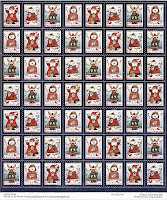 The 1946 Portrait Christmas Seals are usually collected in a block of sixteen (16) with twelve (12) normal seals. Further, be sure to check out our supplies, catalogs, or album pages. Enjoy your collection. Online stamp dealer of Christmas TB Seals, Easter Seals, Charity Seals, Topical Stamp Packets, Foreign Stamp Packets, Stamp Mixtures, Collections, Pictorial Postmarks, USPS Souvenir Pages, and other philatelic material. Plus Crate and Cigar Box Labels. Bill is a member of the APS, RPSC, CPC, CS&CSS, and the IPDA.